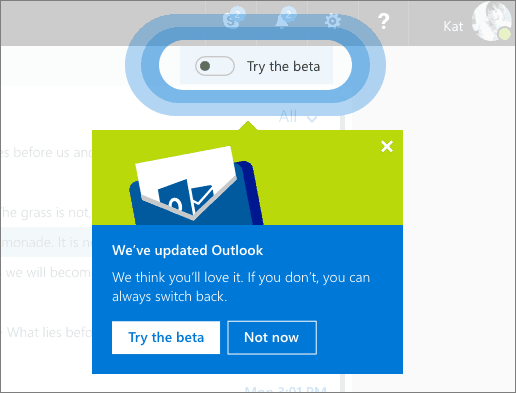 Microsoft today announced it is rolling out a new opt-in beta program for its Outlook.com email service. Here’s what you can expect. 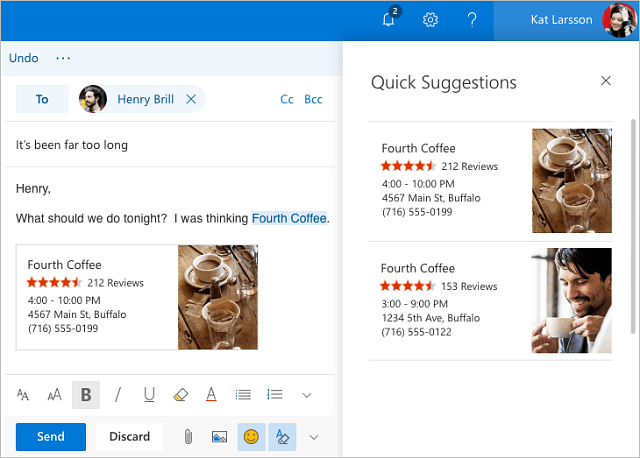 Microsoft today announced it is rolling out a new opt-in beta program for its Outlook.com email service. The company promises that it will provide users with access to a faster and more personalized online email experience. The team will roll out a new toggle switch for you to join up with the beta program and if you aren’t happy with it, you can easily toggle it off and go back to the old version. Microsoft’s Outlook team says the Outlook.com beta opt-in web experience will start rolling out to users over the next few weeks. Here’s a look at what’s new and improved over the current version. Faster experience. The team in implementing a more responsive web framework that will deliver upgraded search abilities, a modern conversation style and new design that allows you to see, read, and attach files faster. More personalization. 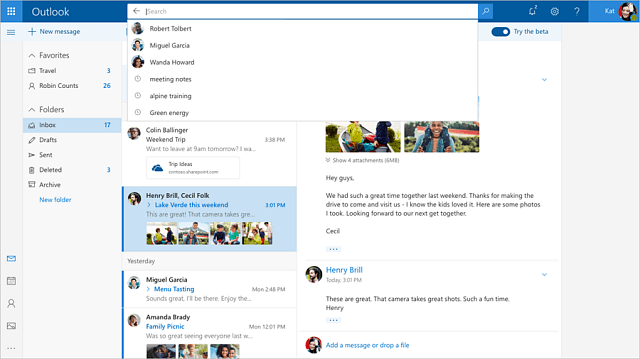 You’ll now be able to personalize your inbox with favorite people and folders. This will make it easier to find contacts, files, and previous conversations. 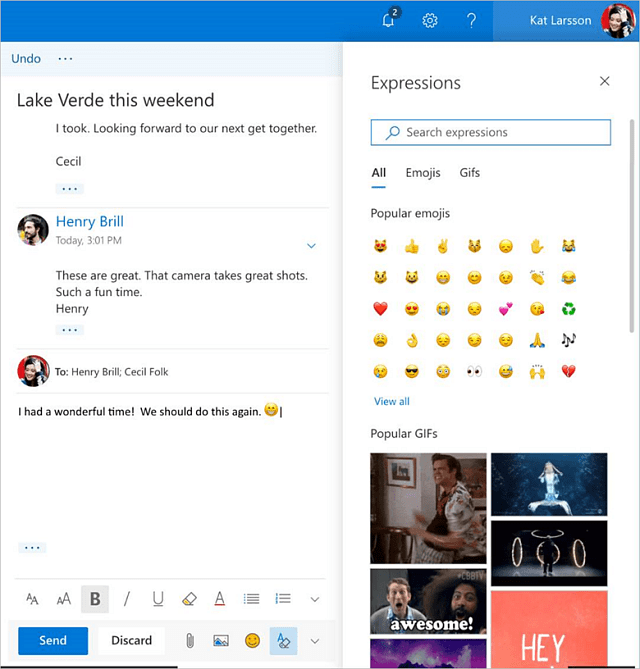 It will also provide a way to make messages more personal with access to several more expressions, emoji’s, and GIFs. A Smarter Inbox. Your inbox will now show suggestions as you type. You can easily add info about flights, restaurants, or favorite sports team schedules to your conversations. It will also add an improved photo experience that places all photos sent or received in one place to make it easy to access from a central location. Other enhancements will be rolled out over the next few months which include updates to Calendar and People. The team says that it will improve and refine features based on user feedback. You will get a message (shown below) that will pop up in the upper right-corner of your inbox when the beta is available to you. Again, this is a staged rollout so if you don’t see it right away, Microsoft says you’ll see it in the next few weeks. For a complete list of details about the program, how to submit feedback and frequently asked questions, check out this blog post from the Outlook team. Have you been offered the beta yet? Leave a comment below and let us know what you think. Huh – feels like they just refreshed it with the focused inbox and other items. Nice to see more innovation here. I like it too BUT I am old school and set in my ways. That means I hate to give up NOTES as a part of Outlook. If I could link the new OneNote into Outlook.com I would rush to use it ! I tried it. Its CRAP that’s how I felt after 2 minutes, and my opinion has not changed days later. The old site is rubbish and this is worse in my humble opinion.